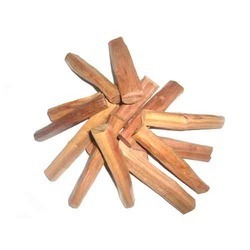 We are highly acclaimed in this industry for providing an optimum quality range of Vijaysar Wood Sticks. Habitat: The drier, hilly zones of dry deciduous forest. Part Used: Heart Wood, Leaves,flowers. Our team of experienced professionals assists us to offer high quality Vijaysar Powder at highly competitive price to the clients. Made from 100% Pure Vijaysar (Pterocarpus Marsupium) wood to effectively control blood sugar (Diabetes) . Vijaysar Tumbler used to controll blood sugar in diabetes since historic times in India. Parts of the Indian Kino (heartwood, leaves, flowers) have long been used for their medicinal properties in Ayurveda. 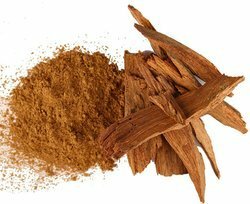 The heartwood is used as an astringent and in the treatment of inflammation and diabetes, for which it has been shown to be effective due to its high pterostilbene content. In vitro studies into the plant's anti-diabetic properties have also been carried out. We are offering best quality forest permit pterocarpusmarcipium heart wood chips with competitive prices. In cases of inflammation, swelling, herpes, leucoderma, tinea infection etc, the leaves paste is prepared with water and applied over the affected area. In case of external injury, its heart wood paste is applied to relieve pain and swelling. Being well-distinguished companies in the market, we are into offering Vijaysar Herb. Pterocarpus is a genus of pantropical trees in the Fabaceae family. It contains about 35 species, with P.